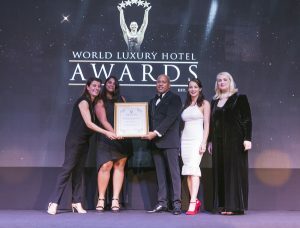 AYANA Resort and Spa, BALI, Indonesia was the venue of choice for this year’s prestigious black-tie event celebrating the 12th anniversary of the World Luxury Hotel Awards. Over 360 guests flew in from around the world to attend the event, which awarded the world’s finest hotels for their luxury offerings and exceptional service delivery.Set across 90-hectares along Jimbaran’s golden mile, AYANA Resort and Spa, BALI, is a world-class destination resort. As the property approaches its 22nd birthday this November, the privately-owned resort holds more fame than ever. AYANA is recognized for prolific sunset and ocean views, as well as offering an ever expanding selection of five-star accommodation and facilities, coupled with the genuinely warm Balinese hospitality that has put AYANA on the map. Over the years, AYANA has received many top-shelf accolades including Luxury Honeymoon Resort Global Winner for the World Luxury Hotel Awards 2017. Participants from over 100 countries sipped on cocktails after being welcomed on the red carpet. During the reception, guests enjoyed the relaxing sounds of traditional Jegog instrumental background music followed by Okokan and Kecak dances. Jegog is a form of gamelan music indigenous to Bali, played on instruments made from bamboo, and the Kecak dance is a form of Balinese Hindu dance and music drama that was developed in the 1930s. Keeping with this year’s theme of celebrating Indonesia’s rich archipelago & culture, guests were then welcomed to the gala dinner by a Panyembrama Dance, which is a traditional Balinese welcome dance, and an intimate live performance by Gus Teja, a flute maestro. The unique set up of AYANA’s Grand Ballroom invited guests to learn more about Indonesia’s beloved arts and crafts and included interactive displays such as batik making, wood carving, and learning the secrets of Bali’s sought after rain stopper shaman. Guests dined on a thoughtfully crafted menu highlighting Indonesia’s cosmopolitan cuisine including wood smoked baby lobster and sea urchin, inspired by Executive Chef, Patrick Callarec’s trip to Labuan Bajo, Flores Island where the new AYANA Komodo Resort, Waecicu Beach has been launched last September. The gala dinner kicked off with a keynote speech delivered by Prof. Dr. I Gede Pitana Msc., the representative of Indonesia’s Minister of Tourism. During the ceremony, the incredibly entertaining Masters of Ceremonies, twins Maria and Elizabeth Rahajeng, who are TV hosts for E! News Asia, guided the audience through a dazzling awards ceremony where awards were presented to luxury hotels and resorts in over 100 categories on a Country, Regional, Continent, and Global basis. AYANA was honored in a glittering ceremony that was attended by the best names in the industry and swept three categories including Continent Winner, Asia – Luxury Thalasso & Spa Resort for AYANA, Country Winner, Indonesia – Luxury Romantic Villa for The Villas at AYANA, and Country Winner, Indonesia – Luxury Architecture Design Hotel for RIMBA Jimbaran BALI by AYANA. 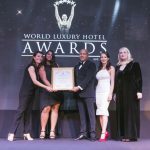 In addition, AYANA received a special award from the organizers of World Luxury Hotel Awards in recognition of hosting the memorable event. After the ceremony, DJ Martin Denev rocked the after party well into the evening at RIMBA’s UNIQUE Rooftop Restaurant & Bar.